On the 2nd of August it was Danny's 20th birthday we attended a dedication service at St Clement's gate leysdown where the Parish council had erected a plaque in Danny's memory. The service was conducted by Father Barry Birtch and many people attended including council officials, the Mayor of Swale and Gordan Henderson MP. It was once again a very special moment , very difficult emotionaly but a real honour. 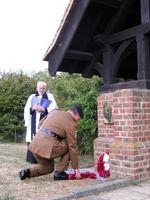 the service finished with the playing of the Last post and Reveille, see attachments below.